A friend just shared with me a very disturbing Newsweek article, "Creativity in Crisis." For years, researchers have been studying and measuring, in quantifiable ways, creativity in children and adults. (They actually call it measuring your CQ as opposed to IQ.) Apparently, creativity scores are a better indicator than IQ scores for future success -- something that should make everyone in academia sit up and listen. For years, the CQ scores of each generation has been higher than the previous. The disturbing news is that, according to a study done at William & Mary, for the first time EVER scores for American children have gone down. It's a long article but worth a read over a cup of coffee or tea. I say: Let them build puppets! And puppet shows! I woke up this morning and trundled down the stairs to the stove. I was in the mood for tea, but my husband is a huge coffee addict, so I started to boil lots of water. I stared off into space, and my eyes settled on the kettle my husband uses to brew his coffee. He uses one of those cone filters over an old camping kettle. We used to use one of those glass Melita pots, but after numerous episodes of leaving the burner on and cooking an empty glass pot to the cracking point, we gave that up. Anyway, I started thinking about my upcoming 365 project -- infinitely more fun than thinking about all the unpacking we still need to do -- and realized that if you inverted the kettle, it would look like it had a moving mouth with the spout making a perfect Roman nose...a puppet! Part of me wishes I was starting now, but I quickly realized that I don't know where the camera is...making picture taking a bit difficult. 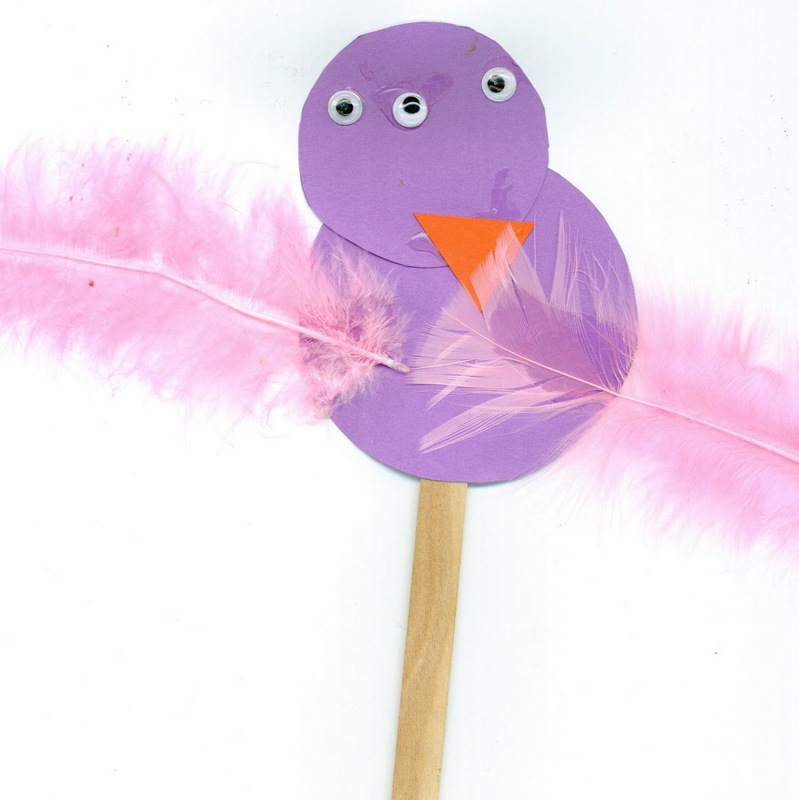 But I've been thinking of so many different types of puppets I could make and so many different materials to use. It's been fun looking at all the shapes found in large blocks of Styrofoam in some of the boxes we are unpacking. My husband just raises his eyebrows, shrugging, as we create piles of things to take out to the studio. Things destined to become puppets. It's way too exciting -- I'm sure I am going to drive my family crazy! A good friend of mine, Noah Scalin, recently came out with a new book, 365 A Creativity Journal. The book was born of his own project, which involved making something skull related every day. His personal creativity project grew in unexpected ways -- a 2008 Webby award, a book, an appearance on Martha Stewart, and a host of other, well, really cool things. Skull-A-Day is worth a click just to see how he did it -- how very, very well he did it! I've been pondering my own 365 project. Just pondering. My birthday is next month, so I think that's an obvious day to start. It's been a busy time for me as of late: we just moved, we are still unpacking, I homeschool, I am still building a new puppet show... I have a bazillion reasons NOT to do this, which is why I think I should. The question for me is (because I always have questions, and I spend waaaaayyy too much time contemplating stuff...especially as I am still unpacking my family's life into this Cape Cod style house), what to do for 365 days? I came up with a bunch of ideas but feel like I am clinging to the fence. I've visited some other sites like Toy-A-Day, where a man named Paul is making a new toy a day for 2011. I like his idea because it seems challenging to me -- because I am really trying to figure out how to do a "Puppet-A-Day" for my 365 project. My youngest daughter made this three-eyed purple chicken ALL BY HERSELF! I love the creativity of children who don't know the "rules" yet. I know what a perfectionist I am. I know how I tend to try to do things that are really, really complicated. But maybe that's why I should just do it. Maybe it would force me to loosen up a bit and not be such a perfectionist. Tricky. I have thought of other things that seem more imminently do-able. A letter-a-day was one idea. I love writing letters. To be honest, I do it often...I just don't often get the letter in an envelope with a stamp and into the mailbox very often. With all the unpacking I am doing (and should be doing right now -- not blogging, mind you), I feel like 365 Unpacking or 365 Things I Threw Away in 2011 would be a good choice. Of course, I really just need to throw out those things this weekend, not spend all year mulling it over! I've come up with a million reasons (yes, excuses) to not do a 365 Puppet-A-Day blog. Most revolve around the idea, "I am too busy." But I feel like that is such a cop out. Yes, I am too busy. Maybe that's my problem, though? I'd like to reconnect with the simple joy that I remember when I first fell in love with puppetry. Turning your passion into your career is fabulous, but sometimes you do lose some of that initial joy. And I've been passionate about puppetry now for a while. Not counting my childhood fascination and early creations, I've been actively involved with puppetry since 1994, when I caught the bug and attended my first puppet festival. That was an amazing festival, by the way. I ate, drank, and slept puppets for five days. OK, in truth, I didn't really sleep. I stayed up late, hanging out with puppeteers and puppet builders, and just could not sleep. It really was like falling in love. You meet that person and want to hang out with them all the time...only it was puppets, which might sound really, really creepy to some people, I guess. So, now that I am here typing away towards 600+ words, I guess I realize that I just have to do it. At least, I have to attempt it. So...get ready. I'm going to finish unpacking...and then...well, you'll see!